← Can radio amateurs command the ISEE-3 / ICE spacecraft ? The SUWS WebSDR, a VHF/UHF/Microwave online radio, now has improved antennas for reception of amateur radio satellites and High Altitude Balloons (HAB). 10 GHz – the Octagon PLL LNB based system is working well and now has the correct frequency labels on the scale (rather than the RTL dongle tuning range). The Octagon does drift up to 30 KHz high with temperature which is not bad considering it is unmodified and mounted on the mast, and you can get an accurate frequency calibration from GB3SEE which is visible at all times on 10368.850. We have seen some very interesting propagation effects (both RS and tropo) with GB3CCX and GB3LEX was audible last week during the lift. 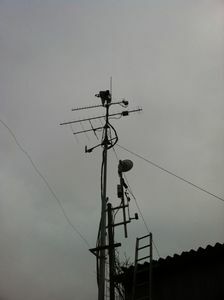 1.3 GHz – the SPF pre-amp is now mounted at masthead. There is some small frequency drift from the RTL dongle but GB3FN is very loud at all times and GB3MHL / GB3DUN are now audible with the any improvement in condx or aircraft scatter (Heathrow lies directly on the path to MHL).